In my previous post, I described how my partner and I eventually decided to move-in together. Then, decided that we both wanted to find out our baby’s gender from the very beginning. Firstly, because we couldn’t wait a whole nine months to find out. The suspense would kill us. Secondly, because by knowing, we could start organizing clothes and other items, making our lives easier. My partner had very high hopes that our baby would be a boy, and for the first 16 weeks he only believed this. In a way, he refused to think about the possibility of our baby being a girl. This was somewhat concerning to me because what would happen if it did turn out to be a girl? How would he react? I felt like there was this pressure on me for our baby to be a boy. To me, either gender was ok, despite desperately wanting to know to start buying adorable little clothes for baby. As I was going through the first stages of my pregnancy, I first thought that it was a boy and then I started to think it was a girl. This was only because I’d heard a rumour that if you crave sweet foods when you’re pregnant, then you’re having a girl. And, if you crave savory, then it’s a boy. Since I couldn’t stop eating Haribo candies, it had to be a girl! Since I was a child, I’ve never particularly liked candies so much, so this was out of the ordinary for me (I was going through about two packets per day!). It was me that decided I wanted to go to a private baby scan clinic, as they offered you the chance to find out your baby’s gender sooner. They were able do an ultrasound as early as 16 weeks, whereas my hospital would scan me only at 20 weeks. I’m really glad I actually got the chance to do this, as we had all of our family members in the room with us when we did find out. This made the moment even more special. Plus, we got some of the best baby scan photos from the ultrasound compared to what we got before, which I will now be keeping forever. Although, when they offer you the chance to do a 4D scan at 16 weeks your baby does look very very strange, they even pre-warned us by saying they tend to look a bit like an alien and they were certainly right, but it was quite funny. 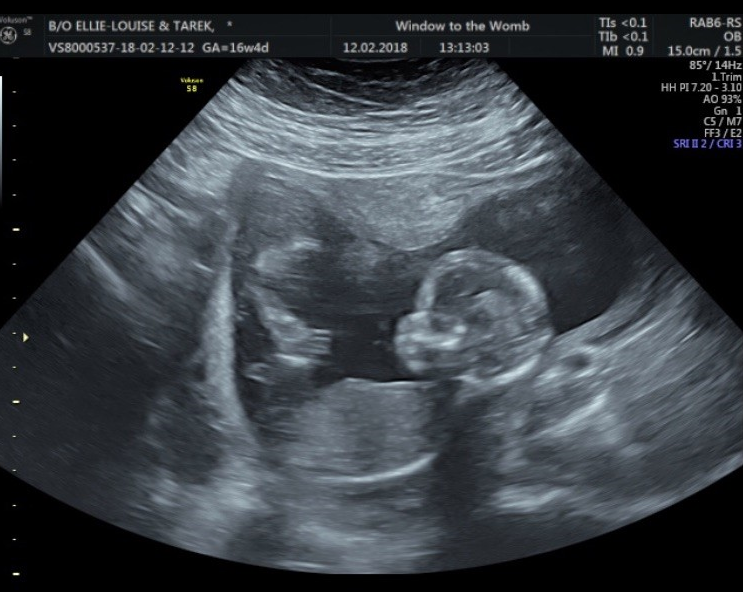 When we sat down before we went into the room to be scanned, I was very very nervous because I was worried how my partner would react if the baby weren’t a boy. Even when I sat down next to him and questioned him about how would he feel if it was a girl, he automatically said that it wouldn’t be. I can remember lying down on the bed with the ultrasound jelly on my bump, waiting anxiously to find out if it was a girl or a boy. There were screens all around us in the room, so you could never miss a single sight of our baby. At first they checked the heartbeat, and this thumped across the whole of the room. It was so loud that I can still hear it now, as I think back to that memory. It took them a while to find out the gender, as our baby wasn’t in the right position. In fact I had to go out of the room and have several glasses of cold water, and then walk around outside for about 15 minutes, before I could re-enter the clinic and get scanned again. After this, it finally worked and we found out that we were having a girl! I was very happy to hear this, but I was happier that our baby was completely healthy, as they also did a well-being check while I was in the room. My partner was at first disappointed that we were not having a boy, and he was a little upset by this because he had imagined what it would be like having a son for quite some time. After a few days he had adjusted to the thought of having a daughter, and in the end was happy with the news. Instead he was now imagining all the things he could do with her when she is growing up, like taking her to the cinema and for ice cream, which I find adorable. It did hurt a bit at first that he was disappointed about having a girl. Perhaps, I didn’t understand why he cared so much about having a boy over a girl. Afterwards, we both spoke about the situation and how he felt. He explained to me that, ever since he was a teenager, he had always dreamt about having a son. He said how he had imagined him with spikey hair, with a leather jacket on, and sunglasses. In a way, a mini him. He told me he couldn’t wait for the days when he could teach him to play a musical instrument, go and see bands together, and teach him all about businesses, so he can follow in his footsteps. He said that he got excited about this being just around the corner, and got his hopes up a lot over it, as it’s something he has imagined since he was a kid. In a way, I could then see his point of view, because what girl hasn’t imagined having a daughter and dressing her up in fancy clothes, maybe going and getting their nails painted together, etc etc? After we spoke, I understood much more the issues. It was very important that we discussed them, since it made me understand his point of view. Ellie’s Pregnancy Journey Part 1: Am I Pregnant?